Browse the latest Android 5.0 Lollipop apps or read your favorite online media comfortably with a unique barrel-edge grip that sits naturally in your hand like a magazine or novel. The keyboard attaches magnetically for convenient 2-in-1 productivity. Reverse it for slate, tent or stand positions so you can enjoy the Venue 10 in four different ways. A gorgeous 2560x1600 resolution OLED display, front-firing stereo speakers and MaxxAudio® by Waves bring it all together for crystal-clear video conferencing or Skype™ chats. The Venue 10 7000 Series is a razor-thin tablet uniquely designed to fit everywhere into your life. Attach the easy-on easy-off keyboard to its unique barrel-edged design and work on the go. With the latest Android 5.0 Lollipop enabled to support Android for Work, you can email, video chat or enjoy the latest apps on gorgeous 10.5" OLED touch screen with 2500x1600 resolution. Depth photography and 3D editing: Advanced photo editing is easier than ever with the integrated Intel® RealSense™ Depth Camera and the new Dell Gallery. Three cameras c reate a high-definition depth map that enables measurement, refocus, and selective filters with a touch of a finger. No matter where you focus your lens when you snap a picture, you can re-focus afterward to highlight any section of the image you want. Blur the foreground or background, filter shades from black and white to color, or adjust contrast and brightness. Precise measurements: Measure length, width and height to scale with depth photos via Dell Gallery . See how high your jump shot is, find out the surface area of that wall that needs painting, or rearrange your living room and compare objects with true-to-life data. Organize important moments in your life, beautifully. The Dell Gallery connects to your favorite social media sites, and then sort them into a single album, along with social media comments and likes. Locate photos by date in Timeline View, geographically in Maps View to relive your travels or by person with the facial recognition feature in People View. The new Dell Gallery is the perfect home for all of your memories. Dell Cast makes it simple to get down to business or enjoy big screen entertainment. 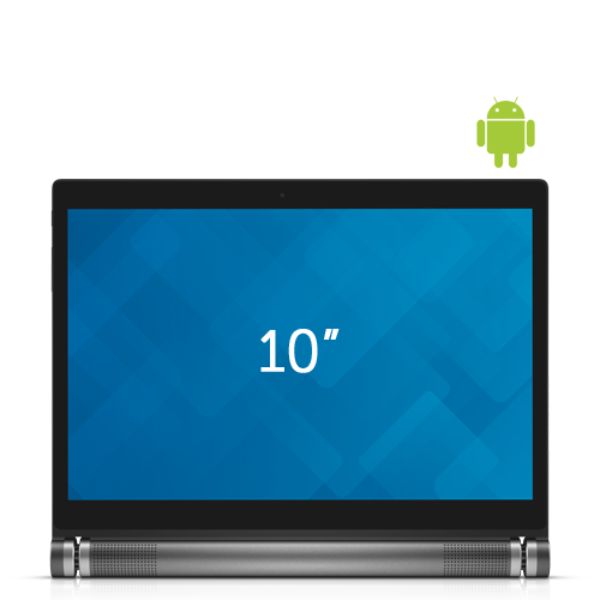 Dell is the only provider to give Android users a desktop experience with Dell Cast. You can turn any screen into your desktop, and connect with a keyboard and mouse to use your tablet like a PC. With the software app and optional adapter, you can check email or work on documents, and you can stay organized with handy tiles and multiple browser windows. It’s also simple to project anything you’re viewing on your tablet. Just plug Dell Cast into an HDMI port and beam your screen straight from your Dell Venue 8 7000 Series tablet onto your TV or monitor. High-performance browsing: Enjoy lightning-fast web surfing with the latest Quad-Core Intel® Atom™ processors. Intel Inside® lets you listen, watch and be productive anywhere. Latest technology: Take care of business with the latest Android 5.0 Lollipop, enabled to support Android for Work. Expect improved voice recognition, printing from the cloud, a better interface for an immersive app experience and faster multitasking. More storage: The Venue 10 has a 16GB* hard drive, plus a microSD card slot for up to 512GB*of storage. Power player: Spend more time away from the outlet with excellent battery life. Complete your experience with accessories designed to make the most of your tablet. Protect your Dell Venue 10 with a custom fit sleeve that’s snug and stylish. Enjoy big sound from a portable speaker you can take with you.